Average mortgage rates plummeted on Friday, ending a three-day run of remarkable falls. Such large drops are far from unprecedented. But ones of this size are rare. Have we hit bottom? Will they fall further or might they bounce back up, at least a little? Friday’s tumble was triggered by bad economic data in Europe and accelerated by poor figures here. Some good news might change all that. But probably not today. Markets were subdued this morning. And the data below the rate table are indicative of mortgage rates edging downward, but probably not as sharply as we’ve seen recently. So this morning’s markets started out sluggish. Any bounce you might have expected from the publication of the Mueller report hasn’t materialized. 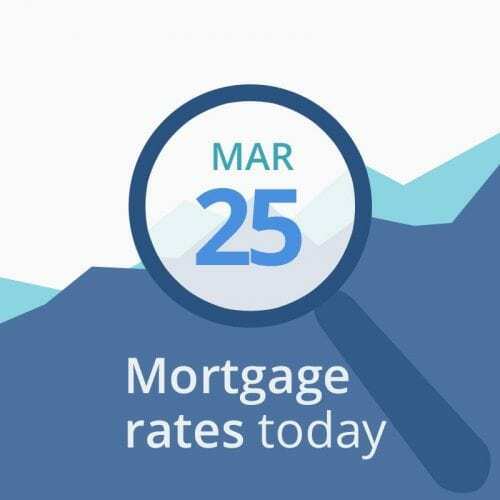 And, absent big news changing things, mortgage rates look likely to have a quiet day, certainly compared with the last few sessions. Of course, it’s possible the Federal Reserve’s statement last Wednesday has established a long-term downward trend. But you can still expect to see rises and falls within that as other risk factors emerge and recede. And, depending on how near you are to your closing date, you may not have time to ride out any increases. If Parliament enacts the Prime Minister’s preferred withdrawal agreement by then, a further extension into May will automatically kick in to smooth the necessary administrative processes. If Parliament declines to pass that deal (it’s likely to get a third vote on it this week but has already rejected it twice by large majorities) by the April deadline, the UK will have to settle on one of two choices. First, it can crash out without any agreement and hope to trade under World Trade Organization rules. This is the so-called no-deal option. Nearly all economists and most businesspeople think that would be a monumental folly that would cause immeasurable economic self-harm. Or, secondly, it can request a much longer extension (maybe two years) during which it can negotiate a new withdrawal agreement, or hold a second referendum or general election to break the political deadlock. Starting today, it will be a busy week for parliament. But there’s nothing to see today.